Probably the Earls of Ashburnham, Ashburnham Place, Battle, Sussex. Wendell Cherry, sold Sotheby's New York, 14 October 1988, lot 62. Apollo, August 1973, No. 138, p. 31. The Somerset House Art Treasures Exhibition, London, 1979, No. F72. A pair of consoles of this model is illustrated in the Great Drawing Room at Ashburnham Place in 1916 (Ashburnham Place - II, Country Life, January 19, 1916, fig. 8). The consoles are identical except that they each appear to have a solid back. An examination of the pair in this lot indicates that they were not originally made to take a solid back, but the presence of two holes on the back of each indicates that at a later state they could have been given one. No other consoles of this very rare model are known. 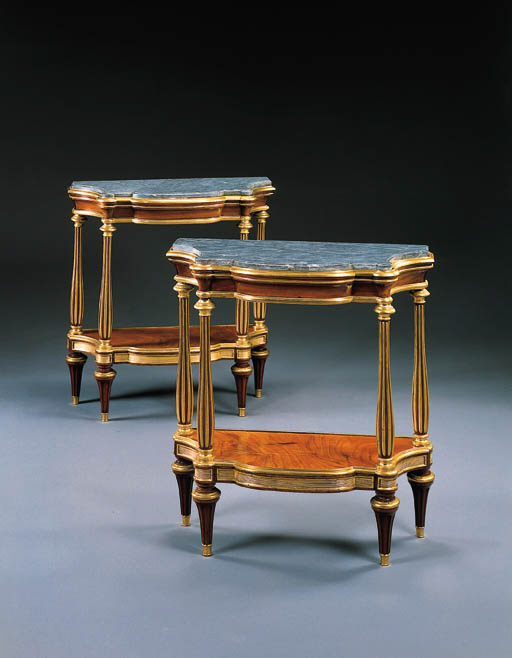 The Earls of Ashburnham formed a remarkable collection of French furniture, especially of Louis XIV and Louis XVI boulle furniture. The Louis XIV bureau plat by André-Charles Boulle from the collection of Hubert de Givenchy (sold Christie's, Monaco, 4 December 1993, lot 68) formed part of the collection and was also in the Great Drawing Room at Ashburnham Place. The collection was sold Sotheby's, London, 26 June 1953 and Sotheby's house sale at Ashburnham 7-9 July 1953. The pair of consoles from the Great Drawing Room does not appear in these catalogues and had presumably left the collection beforehand. Between 1781 and 1783, the Second Earl's son and heir, Viscount St. Asaph (1760-1830), embarked on the grand tour. Regular payments are recorded to the Parisian banker Jean Frédéric Perregaux, including a total of £2316 15s between October 1788 and the end of 1789. It is possible that he purchased the consoles from Daguerre in Paris. This is reinforced by the fact that the 1953 Ashburnham sales contained various pieces by Weisweiler which one would normally expect to have been provided by Daguerre. The second, third and fourth Earls were all considerable collectors. Their purchases originally furnished Ashburnham House, Dover Street, London, before the house was sold in 1897 and the contents moved to Sussex.